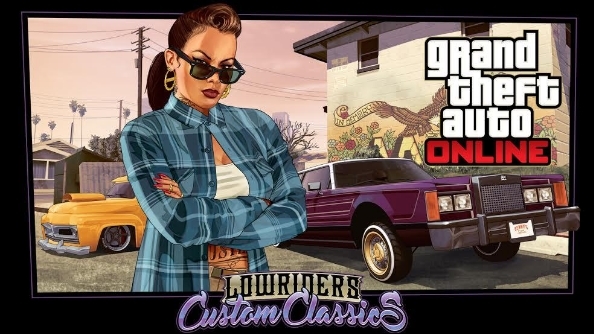 Rockstar have updated GTA Online with the new Lowriders: Custom Classics pack. The update allows players to choose new custom car components at a chop shop, as well as adding new weapons, styles, and game modes to the online world. Like your action large-scale and free? You need one of the best sandbox games on PC. If you take a Donk, Slamvan, or Virgo to a Benny’s Motorworks shop you’ll be able to upgrade them with custom parts to create the Faction Custom Donk, Slamvan Custom, and Virgo Classic Custom. Naturally they’re over-the-top, bombastic whips that wouldn’t look out of place in a hip-hop music video. When riding around in these new wheels you can perform drive-bys with two new weapons: the compact rifle and double barrel shotgun. You can do that while travelling to the new PvP mode: Sumo. It’s a game where players have to drive cars in an arena and try and force the opposition out of the ring. It’s wresting with cars, basically. In addition, 16 new tattoo designs, three new haircuts for each gender, and a bunch of new clothing options are now available. The Lowriders: Custom Classics update is available now for GTA Online. Just log in and you’ll find it waiting.